The mystery of the Holy Family of Nazareth deepens our appreciation of the Incarnation, sanctifies our own families, and teaches us to seek the universal family of all creation. My homily for this weekend is posted here. It was a quiet day after this morning's funerals, so I decided to take a good long walk around the neighborhood before the work week begins again in the morning. I saw a lot of little Bethlehems set up on lawns, in front of churches, and even one up in a tree house. I love the concept of making the Christmas mystery concrete; the Word of life that we have seen and heard and touched with our hands as the first letter of John says. When I see them I try to pray in thanksgiving to God for the devotion of those who took the time to set them up and witness to their faith. 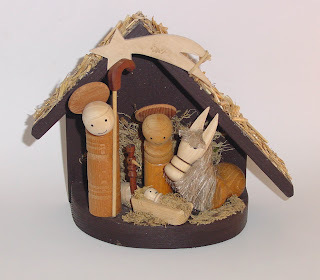 I also like how all these different nativity scenes range from the tasteful and beautiful to the tacky and corny. When I see the good ones I try to thank God that despite all of the violence and darkness of this world, people still insist on making beauty. When I see the ugly ones I try to remember how the Lord was born away from anything considered important or beautiful in his time, and I also pray for the people in China or wherever who made the animals and people, perhaps without even knowing what they were supposed to mean. It's always a little jarring to celebrate the great feasts of martyrs right after Christmas, the feast of St. Stephen on the 26th and the Holy Innocents on the 28th. I think that they serve as a counterpoint to the sweetness of the Nativity stories, and they remind us both that the Lord's life was beset with violence from beginning to end, and that the world "did not know him" and remains somewhat hostile to God to this day. It reminds me of when I was still living in Boston there was a controversy over whether the state should be able to display a Christmas tree, i.e. did it violate the "separation of church and state." A reporter stopped me on the street in Harvard Square and asked my opinion. I said that no one could reasonably accuse a state that was mean to foreigners and supported "gay marriage" as endorsing Christianity, and so Christians ought to be the first ones trying to prevent it from displaying a Christmas Tree. The mystery of Christmas is upon us, the mystery of God's re-creation of our humanity through the Incarnation of the Word. I have our midnight Mass tonight, for which I'm giving the homily I posted last year. I've never had a chance to offer it live, and I like it a lot. For Mass during the day tomorrow, my homily is posted here. The mystery of the Lord's birth is near. Jesus our Emmanuel, "the true light that enlightens everyone" is coming into the world. My homily for this weekend is posted here. For some beautiful and rich reflections, check out Prophetic Fraternal Franciscan. 1. Someone could be born from neither a man nor a woman, as was the case with Adam, who came directly from God. 2. Someone could be born from a man, but not from a woman, as was the case with Eve, who came from Adam's side but had no human mother. 3. As it is with just about everybody else, one can be born from the union of a human mother and father. 4. This leaves just one more possibility, for someone to be born only of a woman, with no human father. This is, of course, the virgin birth of Jesus. Thus completing the possibilities for how one can come into the world, Jesus provides creation with a certain completeness and universality. I pointed out this argument to one of my teachers once, and he said, "It's like, see how cute and clever God is." Nevertheless, it is Bonaventure's way of getting at the completion of creation in the Incarnation and at a sense of fullness of purpose for God and the world that it brings. For the real text, see Breviloquium IV:5. One of the brothers forwarded me an e-Christmas card yesterday. It was from one of the few prestigious graduate schools of Catholic theology here in these United States, where they educate and train many candidates for ordination as well as women and men for lay ecclesial ministry. And there it was: "Season's Greetings." Now I expect this from the capitalists and the lovers of this world who celebrate not Christmas, but Yule. But from a Catholic school of theology? Many martyrs and missionaries gave up their efforts and lives to convert our ancestors from the worship of seasons to the worship of the living God. Should we thus mock them? To riff on St. Paul, preaching Christ crucified is indeed a stumbling block and foolishness to the secular holiday of "Christmas." The great days of our proximate preparation for the Nativity of the Lord have come again, and we are singing the beautiful "O antiphons" again. O Wisdom, O Lord, O Root, O Key, O Dawn, O King, O Emmanuel. These antiphons, these names for our Lord, almost overwhelm with the breadth of the mystery of the Incarnation, with the richness of possibility in the titles of Christ. The titles of Christ go on and on even in the Scriptures themselves, showing us that the mystery of Christ is an inexhaustible richness for us. There are certain moments in ministry when you are really grateful for certain courses you took in school, like today, when you get up in morning and find yourself having to preach on Matthew's version of the Lord's genealogy at ten minutes to seven in the morning. So I was glad for the class notes that reminded me that the three sets of fourteen generations that begin the New Testament are more than a catalog of funny names. Against all who complain that the Abrahamic traditions are nothing but patriarchy, Jesus' genealogy reminds us of four special women among the Lord's ancestors: Tamar, Rahab, Ruth, and finally, Mary. Against those who want a god who is only interested in the pure or the holy, we are reminded that Jesus' was descended from a line of kings who were both good and bad. With joyful expectation we hope for our re-creation and renewal in the mystery of the Incarnate Word. My homily for this weekend is posted here. One of my favorite things about maintaining a blog is watching the search engine results that refer visitors to it. And one of my recent favorites is the visitor who came here after putting "Acedia Christmas" into their Google. I feel for this person, because acedia is the real danger we face in our struggle against the secular holiday the world insists on calling "Christmas." All of the noise, the lights, the outrageous consumerism and continuous pushes toward conspicuous consumption, it can easily drive from us our taste for prayer and spiritual things, leaving us in the dangerous state of acedia. And there we can easily fail to notice the God who decided to be born in secret, away from home and in a place that nobody in that world considered to be of any consequence. And that's something we should keep in mind when the constant din of commercials try to play on nostalgia for a sense of home. Theological reflection doesn't exist in a vacuum. In fact, the Incarnation of the Word demands that the our personal, concrete situations in life will influence our reflections on faith. I've been aware of this in a special way this week. In a space of 48 hours I led three funeral Masses, three final committals, and two wake services. That's about four homilies, and it's a lot of Christian reflection on death. It challenges me to believe what I say. It challenges me to believe that bodily death can do us no harm because we have already died in our burial in the waters of baptism. It challenges me to rejoice in the free availability of the Resurrection for all who will accept it. It challenges me to know that just as dead grain of wheat becomes our true food in the Eucharist, so God harvests all the love and goodness we allow him to express through us in this life, gathering it all to himself and making it permanent and indestructible in his eternity. The Father does not judge anyone but he has given all judgment to his Son [. . .] because he is the Son of Man. It is today, in the present, that our future destiny is decided. It is through our actual behavior in this life that we decide our eternal fate. In the twilight of our days on earth, when we are about to die, we shall be judged on the basis of our similarity to the child whose birth shall occur in the plain grotto in Bethlehem since it is He who is the God-given standard by which humanity shall live. The Father who is Heaven, who through the birth of His one and only Begotten Son has shown us His merciful love, calls upon us to follow His steps and turn our lives, as He did, into a gift of love. What more could we say about the good news of Christmas, apart from the revelation of God's perspective on what it means to be a human being? Recently a friend sent me a link to Reserve a Spot in Heaven. This website purports to sell reservations for the hereafter in heaven, complete with certificates and credentials. Naturally I went immediately to their disclaimer page. There I read the truth: "We in no way can guarantee someone entry into heaven." To be fair, they do offer a refund to anyone who buys their "humorous gag gift" and then "in fact did not get into heaven." The theological problems with this whole thing are many. First of all, heaven is not something to be desired for itself. We are called in this life to love God and to accept his love for us and our fellow creatures. If we soften our hearts and daily dispositions in this way, we hope that our birth into eternal life will be the same in kind. That's what we call our new life in the eternity of God. If we spend our lives turning against God's love and closing ourselves to compassion for each other, we run the risk of making ourselves so indisposed to Love that we will reject God in finality. And that's what we call hell. Second, the whole gag is based on the idea of a scarcity of grace, as if there was only so much "room" in heaven and we had better reserve our own spot now. With apologies to those who read Revelation 17 to suggest that only the 144,000 will be saved in the final end, grace and salvation are never scarce but rather super-abundant. As one of my teachers from theology likes to say, "grace is free, but it's not cheap." There are no reservations for heaven. But there are tastes and glimpses that will make us desire it. And the desire for the presence of God and the Presence itself are nearly the same thing, because God is a consuming fire and a burning passion. John the Baptist announces the appearance of the Lord and the judgment of the world that Jesus Christ himself will be. My homily for this weekend is posted here. It's nothing new to rant about how the secular holiday of "Christmas" always ruins the observance of Advent. I even know a priest who says, provocatively, "I don't celebrate Christmas. I celebrate the Nativity of the Lord." But even among us who claim to observe Advent faithfully, fighting the influence of the empty promises of advertising and the importunity of Christmas lights and giant inflatable Santa Clauses, I think even we often fail. This is because, as I hear over and over, Advent is "the time to prepare for Christmas." Well, yes and no. It's very clear from the readings and prayers for the first week of Advent that we aren't about preparing for the Nativity just yet. We're about looking forward to the return of the Lord in glory. But since, in a lot of ways, we have ceased to desire or believe in the return of the Lord, this doesn't mean much. Even when we get to the second Sunday of Advent, we are aware of the judgment announced by John the Baptist. Indeed, the Incarnation we celebrate at the Nativity is a judgment; it marks the beginning of the judgment we bring upon ourselves by accepting the Gospel or not. But it's also about the final judgment. Yes, the season of Advent is about preparing for Christmas, but this only becomes a specific and discrete spiritual theme along the way. In the end we really just trying to remind ourselves of a God who is adventitious by nature, appearing as the Other in the life of Abraham, in his Nativity, as our Bread, and as the glorious Lord of all at the end of time. I think I love Advent because I find it to be one of the more mystical of the seasons...not that Easter isn't the most mystical of all, but somehow the mystery of Advent seems more immediate and accessible. We recall our faith that he was begotten of the Father before all time, a perfect Word spoken forth as a complete expression of the Eternal Source. We remember his birth as one of us, taking our human nature, yours and mine, to himself. We look forward to his coming again in glory in the final fulfillment of his Kingdom. Finally, we go back into the darkness and quiet of our own selves, seeking the Lord who is struggling to be born in our prayer, in our discernment, in our knowledge, and in our consciousness. Here we find our own Marian vocation, to be those who conceive and bear the Word, that our souls might become Virgines ecclesia factae, Virgins made church, to use St. Francis's language. To me the mysticism of Advent is the near-overwhelming realization that these are not discrete manifestations of the Son. Though not identical, they are all one. Happy new year, everyone. The year of grace 2008 begins with vespers this afternoon. My homily for the first Sunday of Advent is posted here.